The Aeromonas species, belonging to the family Aeromonadaceae, are opportunistic pathogens found in humans with an incidence rate of 76 cases per million inhabitants in Southern Taiwan,,. Extra-intestinal Aeromonas infections have been reported, with the most common species responsible for human infection being Aeromonas hydrophila (A. hydrophila),. The incidence of Aeromonas septicemia is relatively low, accounting for less than 15% of all cases. The overall mortality rate attributed to A. hydrophila is approximately 50%. Patients of A. hydrophila bacteremia experiencing skin blisters and septic shock have been reported to have a mortality rate of 100%,. The possibility of obtaining the A. hydrophila infection through poor hand hygiene, saline solutions, open skin access due to large bore catheters, contamination of the dialysis catheter by the patient or nurse after contacting with contaminated water supply, must be considered,,. Aeromonas infection must be considered during the differential diagnosis of gangrene-like tissue damage or skin lesions in patients with end-stage renal failure (ESRD), due to the potential sources of infections. All procedures performed were in accordance with the ethical standards of the institutional and/or national research committee (No. CE18102A), along with the 1964 Helsinki Declaration and its later amendments, or comparable ethical standards. Oral informed consent was obtained from the patients for publication of this case report and any accompanying images. During their lifetime, patients consented orally to the use of their history and all the related images and information for scientific purposes. Each patient provided written informed consent for publication. A 49-year-old Taiwanese woman with a medical history of diabetes mellitus (DM) and ESRD, who had been undergoing regular hemodialysis (HD) for 8 years through an arteriovenous fistula over the right forearm at a rural hospital, was admitted to our facility. She was referred to our emergency department (ED) and presented with a one-day course of fever, dyspnea, hypotension, and fulminant hemorrhagic bullae covering her whole body. Upon arrival at the ED, the patient’s vital signs showed a respiratory rate of 34 breaths/min, heart rate of 124 beats/min, blood pressure of 76/48 mmHg and body temperature of 39.5 °C. A physical examination revealed cardiopulmonary distress, pale conjunctiva, multiple hemorrhagic blisters, and a ruptured blister over the lower left leg [Figure 1]. Endotracheal intubation was implanted for both airway protection and ventilation using 100% oxygen. Laboratory investigations uncovered a white blood cell count of 7 600/mm3 with segmented neutrophils of 92.6%, hemoglobin of 8.2 g/dL, platelet counts of 121 × 103/mm3, blood urea nitrogen of 78 mg/dL, creatinine of 6.4 mg/dL, sodium of 138 mEq/L, potassium of 4.9 mEq/L, chloride of 98.0 mEq/L, calcium of 8.2 mg/dL, albumin of 2.1 g/dL, glutamic-oxaloacetic transaminase of 108.0 U/L, glutamic-pyruvic transaminase of 72.0 U/L, alkaline phosphatase of 232.0 U/L, lactate dehydrogenase of 413.0 U/L, lactate 77.5 mg/dL, C-reactive protein of 32.3 mg/dL, blood glucose of 23.0 mg/dL, prothrombin time of 16.2 s, and activated partial prothrombin time of 42.3 s. Arterial blood gas revealed a pH level of 7.061, PaO2 of 88 mmHg, PaCO2 of 30.2 mmHg, and an HCO3- of 15.3 mmol/L at 100% oxygen. 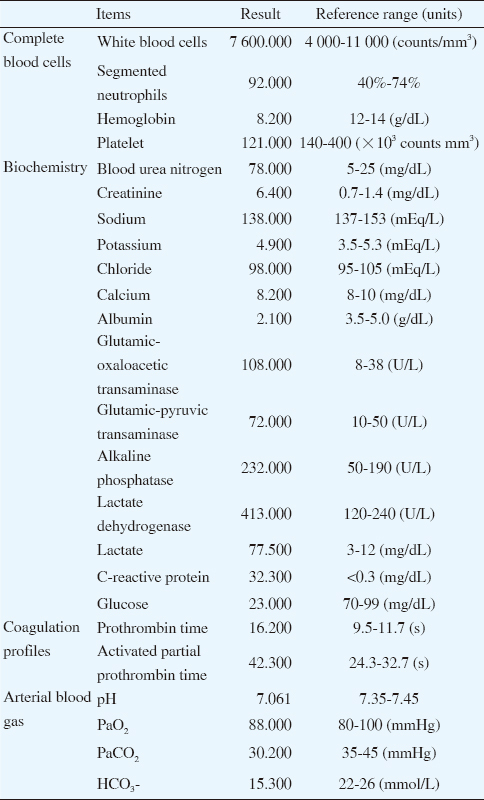 The laboratory data is summarized in [Table 1]. A supine chest X-ray demonstrated cardiomegaly and an infiltration of both lower lung fields [Figure 2]. However, the patient exhibited persistent shock (systolic blood pressure of around 60 mmHg) and expired in the ED despite an aggressive treatment of intravenous fluid, glucose water, ceftriaxone at 2 000 mg once daily, plus vancomycin at 1 000 mg twice daily, and inotropic agents with both norepinephrine and dopamine. Cultures of blood and blister fluid grew A. hydrophila three days later. Figure 1: Multiple hemorrhagic blisters, along with a ruptured blister over the lower left leg. 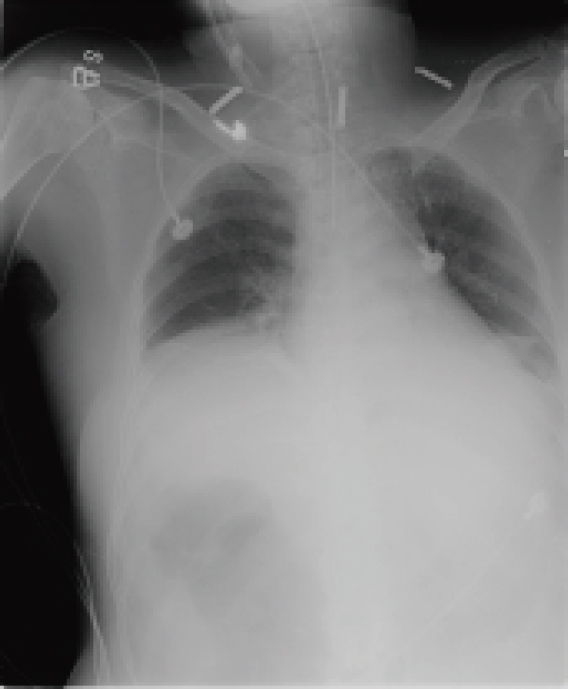 Figure 2: Chest X-ray revealing a tracheal intubation, cardiomegaly, and infiltration over both lower lungs. Table 1: Summary of laboratory investigations. Species of the genus Aeromonas, which are halophilic, non-acid fast, non-spore forming, gram-negative, and facultative aerobic bacteria, belong to the family Aeromonadaceae. They are opportunistic pathogens in humans with an incidence of 76 cases per million inhabitants occurring between 2008 and 2010 in Southern Taiwan,,,,. It is noticeable that infection from the species of the genus Aeromonas has been reported during the summer months. The incidence of Aeromonas bacteremia in Taiwan was 50-143 folds higher than those appearing in Western countries. Four categories of Aeromonas infection have been described including cellulitis, acute diarrheal disease, sepsis, and other types of infections. There have been reports on extra-intestinal infections such as empyema, lower respiratory tract infections, meningitis, necrotizing fasciitis, osteomyelitis, peritonitis, septic arthritis, urinary tract infections, and traumatic wound infections; particularly in immunocompromised patients, such as those suffering from DM, liver cirrhosis, and chronic kidney disease,,,,,. Two well-known predisposing conditions associated with Aeromonas bacteremia in Korea are cancer (42.3%) and liver cirrhosis (39.3%). Incidences of DM and chronic kidney disease regarding patients on dialysis for Aeromonas bacteremia in Taiwan have been reported at rates of 23.5% and 5.0%, respectively. The major focus of Aeromonas bacteremia is hepatobiliary tract infections (50.6%), with the others being primary bacteremia (17.9%), skin and soft tissue infection (4.2%), and catheter related infection (3.0%). The incidence of skin and soft tissue infection progressing to myonecrosis and gangrene of the involved soft tissue has been reported to be 62.5% in India. Three species of the genus Aeromonas, A. hydrophila, Aeromonas caviae, and Aeromonas veronii biovar sobria, are responsible for more than 85% of human infections. The most common species responsible for human infection is A. hydrophila,. Gram-negative microorganisms account for 21%-30% of bloodstream infections in patients who received regular HD. The incidence of Aeromonas septicemia is relatively low, accounting for less than 15% of cases,. ESRD is associated with an alternation in the primary host defense system. A. hydrophila infections and presentations in patients with ESRD tend to vary depending upon dialysis modalities. Systemic infections appear to be more common in patients undergoing HD, due to dissemination of bacteria through the open skin access of the large bore catheters. Alternatively, contamination of the dialysis catheter by the patient or dialysis nurse, after contact with a contaminated water supply or dialysis solution, may result in this type of infection. Contamination of the dialysis solution, along with contamination through touch, may be potential sources of infections,,. We could not exclude the possibility of A. hydrophila infection occurring through poor hand hygiene, saline solutions, the open skin access of the large bore catheters, or contamination of the dialysis catheter by either the patient or dialysis nurse after coming in contact with a contaminated water supply. The overall mortality rate attributed to A. hydrophila is approximately 50%. Several factors are associated with a poor prognosis, including old age, altered consciousness, skin and soft tissue infection, a rapidly progressing infection concomitant with septic shock, pneumonia, alcoholic cirrhosis, and prolonged HD,,,. Patients presented with skin blisters and septic shock have been reported to have a mortality rate of 100%. The mean interval between the onset of Aeromonas bacteremia to sepsis- related mortality is 8.2-10.0 days,. Among the patients, 3.6% were diagnosed with Aeromonas bacteremia progress to the clinical condition and expire within 72 h after arrival at the hospital. Risk factors of mortality associated with Aeromonas bacteremia are metastatic cancer, shock, delayed use of appropriate antibiotics, a prolonged prothrombin time, and an elevated creatinine level. All of the non-survivors experienced evidence of shock. Aeromonas infection must always be considered during the differential diagnosis of gangrene-like tissue damage or a skin lesion, in patients with an immunosuppressed status, such as DM and malignancy. The most active empirical treatment interventions against Aeromonas should consist of third-generation cephalosporins, combined with gentamicin or amikacin, imipenem, and fluoroquinolone in cases of severe infection, where the duration of therapy depends on the site of infection and the patient’s response to antibiotics,,,. Combination therapy involving antibiotics has been prescribed in 49.4% of Aeromonas bacteremia patients. The median duration of antibiotics use is 10 days. Initiation of antibiotics within 6 hours of clinical presentations, such as fever, alerted consciousness, hypotension, and shock, has been observed in 81.0% of patients experiencing Aeromonas bacteremia. Ceftriaxone-susceptibility and ceftriaxone-resis tance has been found in 84.5% and 15.5% of patients with Aeromonas bacteremia, respectively. Timely surgical debridement for removal of the focus of the infection is essential for any infection control to be life-saving,,,. A. hydrophila is an opportunistic pathogen in humans, particularly those with an immunocompromised status. Clinicians should keep in mind that hemorrhagic blistering is a severe clinical manifestation of A. hydrophila bacteremia. The mortality rate is associated with old age, skin and soft tissue infection, septic shock, and altered consciousness. 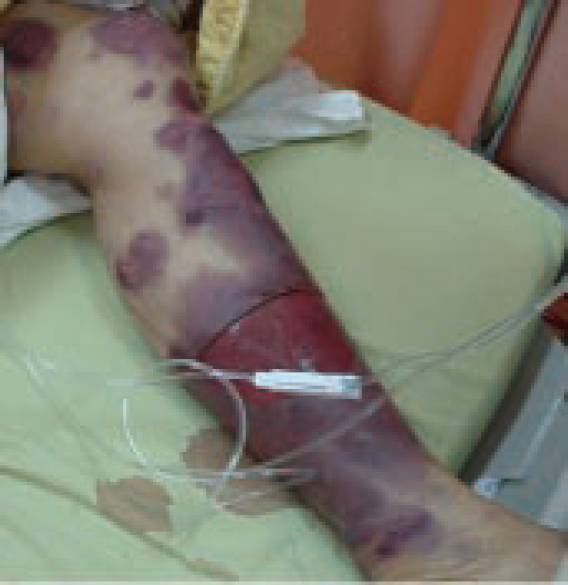 Early diagnosis and prompt management using intravenous fluids, antibiotics, and surgical debridement if necessary, are strongly recommended due to the high mortality rate of 50%-100% in patients experiencing A. hydrophila bacteremia, who are presented with skin blisters and septic shock. We offer our thanks for the efforts of the emergency resuscitation team, radiological technicians and surgical intensive care unit in the clinical diagnosis and management of this patient. Shen HP, Tang YG, Chen XD, Yang SL. Report and literature review on six patients with agranulocytosis accompanied by Aeromonas hydrophila septicemia. Int J Clin Exp Med 2016; 9 (2): 4190-4199. Tang HJ, Lai CC, Lin HL, Chao CM. Clinical manifestations of bacteremia caused by Aeromonas species in southern Taiwan. PLoS One 2014; 9 (3): e91642. Zhou Z, Guo D. Catheter-related bacteremia caused by Aeromonas hydrophila in a hemodialysis patient. Infect Control Hosp Epidemiol 2013; 34 (7): 765-766. Janda JM, Abbott SL. The genus Aeromonas: Taxonomy, pathogenicity, and infection. Clin Microbiol Rev 2010; 23 (1): 35-73. Chao CM, Lai CC, Gau SJ, Hsueh PR. Skin and soft tissue infection caused by Aeromonas species in cancer patients. J Microbiol Immunol Infect 2013; 46 (2): 144-146. Khalil MA, Rehman A, Kashif WU, Rangasami M, Tan J. A rare case of Aeromonas hydrophila catheter related sepsis in a patient with chronic kidney disease receiving steroids and dialysis: A case report and review of Aeromonas infections in chronic kidney disease patients. Case Rep Nephrol 2013; 2013: 735194. Park HJ, Kim HY, Uh Y, Kwon OG, Oh JR. A case of Aeromonas hydrophila necrotizing fasciitis in patient on hemodialysis. Infect Chemother 2007; 39 (4): 218-221. Padmaja K, Lakshmi V, Dakshina MKV. Sepsis due to Aeromonas hydrophila. Int J Infect Control 2013; 9 (4). Doi: 10.3396/IJIC. v9i4.033.13. Papadakis V, Poniros N, Katsibardi K, Charissiadou AE, Anastasopoulos J, Polychronopoulou S. Fulminant Aeromonas hydrophila infection during acute lymphoblastic leukemia treatment. J Microbiol Immunol Infect 2012; 45 (2): 154-157. Syue LS, Chen PL, Wu CJ, Lee NY, Lee CC, Li CW, et al. Monomicrobial Aeromonas and Vibrio bacteremia in cirrhotic adults in southern Taiwan-similarities and differences. J Microbiol Immunol Infect 2016; 49 (4): 509-515. Doganis D, Baka M, Tsolia M, Pourtsidis A, Lebessi E, Varvoutsi M, et al. Multifocal Aeromonas osteomyelitis in a child with leukemia. Case Rep Infect Dis 2016; 2016: 8159048. Batra P, Mathur P, Misra MC. Aeromonas spp. : An emerging nosocomial pathogen. J Lab Physicians 2016; 8 (1): 1-4. Wu CJ, Lee HC, Chang TT, Chen CY, Lee NY, Chang CM, et al. Aeromonas spontaneous bacterial peritonitis: A highly fatal infectious disease in patients with advanced liver cirrhosis. J Formos Med Assoc 2009; 108 (4): 293-300. Banerjee B, Madiyal M, Ramchandra L, Mukhopadhyay C, Garg R, Chawla K. Unusual severe extra-intestinal manifestations of a common enteric pathogen-Aeromonas spp. J Clin Diagn Res 2017; 11 (5): DC01- DC03. Rhee JY, Jung DS, Peck KR. Clinical and therapeutic implications of Aeromonas bacteremia-14 years nation-wide experiences in Korea. Infect Chemother 2016; 48 (4): 274-284. Wu CJ, Chen PL, Hsueh PR, Chang MC, Tsai PJ, Shih HI, et al. Clinical implications of species identification in monomicrobial Aeromonas bacteremia. PLoS One 2015; 10 (2): e0117821. Park SY, Nam HM, Park K, Park SD. Aeromonas hydrophila sepsis mimicking Vibrio vulnificus infection. Ann Dermatol 2011; 23 (Suppl 1): S25-S29.